Leading Australian poly tank manufacturer, Polymaster has introduced a new range of antimicrobial rainwater tanks designed to provide fresher and cleaner water for homes. Manufactured in partnership with global leader SANITIZED AG, Polymaster’s new Waterguard rainwater tanks feature Sanitized Protection – an antimicrobial treatment in the polymer that protects the tank to keep the water fresh and clean. 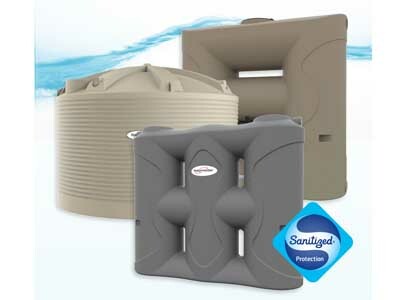 After storing rainwater in your antimicrobial Waterguard tank, you can put the clean water to good use – from washing clothes, watering the garden and filling the pool to even flushing the toilet. Using the stored rainwater will not only help reduce household water usage and water bills but also prevent environmental pollution by diverting stormwater runoff from waterways. All Polymaster rainwater tanks are subject to rigorous health and safety testing. Waterguard tanks are BPA-free, made from food-grade polyethylene and certified to AS/NZS4020 – the Australian standard for drinking water. Conventional rainwater tanks encourage the growth of harmful bacteria inside through excessive build-up of organic matter such as algae, mould and mildew, which can also make the tank dirty and contaminate the water. Polymaster’s Waterguard rainwater tanks are built with Sanitized antimicrobial treatment, which actively inhibits bacterial growth, keeping the tank cleaner and providing a fresher supply of water. The protected polymer surface also extends the life of the tank. Only Polymaster gives you the option of an antimicrobial treatment in the tank’s polymer, included during the manufacturing process. It’s a more convenient and cost-effective way to safeguard your tank against bacteria, with the treatment lasting for many years. The Waterguard range is available in 3 models — Domestic, Slimline and the 2020L Slimline Tank Package in 8 of the most popular COLORBOND colours. Installing Waterguard rainwater tanks will help you achieve a 6-star energy rating when building a new home. The tanks feature a solid one-piece construction with zero joins, and are made with food-grade polyethylene. Each tank is manufactured to the highest quality and certified to: AS/NZS 4766:2006 Polyethylene storage tanks for water and chemicals; AS/NZS 4020:2002 Australian Standard for drinking water; and AS 2070 Part 1 and Part 8 Australian Standard for food contact. Capacity: 2020L; New modern design, quick to install with a built-in pump; Available for Single and Double-Storey pump combinations; 10-year warranty.